We are one of the few medical centers establishing renal osteodystrophy diagnosis and treatment standards for the National Kidney Foundation and have 10 years of experience. Our team receives many referrals from the New York metropolitan area and beyond for bone biopsy, a method to determine the bone health of renal patients. In addition to providing diagnostic care, our physicians also offer special advice about the best treatments for bone and mineral metabolism and hyperparathyroidism. With more than a decade of experience, the Division of Nephrology at Montefiore Medical Center is an established forerunner in the field of renal osteodystrophy. Our Division is committed to the prevention and proactive treatment of renal osteodystrophy, which refers to the bone disease and metabolic disorders prevalent in patients with renal disease. We prefer preemptive treatment to repairing the damage that can occur when diagnosis and treatment is delayed. 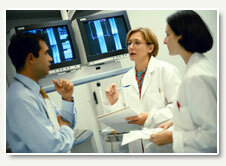 We provide education and training to nephrologists in the New York metropolitan area. In fact, past fellows have started their own kidney/bone disease clinics. Our team has experience in performing bone biopsies to assess the bone health of our renal patients. Recent advances have made it possible to perform this advanced diagnostic method more quickly and with minimal discomfort to the patient. Bone biopsies, which can be completed in one hour, are now performed on an outpatient basis. Patients receive light sedation, when requested, or minimal local anesthesia. With either method, patients have likened the procedure to receiving a filling from their dentist. A highly advanced electric drill, no larger than a pencil tip, is used to take a small sample from the bone of the patient's hip. The sample is analyzed in the lab to provide an extremely accurate diagnosis. We are continually expanding our expertise through research and clinical trials. Among the research initiatives currently under way at the Division are studies that address the effectiveness of new medicines on the parathyroid gland and osteoporosis in renal patients and patients with kidney transplants. We are committed to giving our patients access to the most sophisticated care and follow-up treatment for renal disease and its many consequences, particularly renal osteodystrophy.